It should come as no surprise that building a business of scratch can be an incredibly flummoxing and labor-intensive process. Start-ups tend to spawn with brilliant ideas and honest intentions. But without the proper care, maintenance and planning, those well-intended efforts to boost gain a financial foothold streamline revenue can be futile. And more often than not, its the small, seemingly insignificant financial decisions most business owners make in the beginning that can bring down a start-up organization. However, one tool that start-up business owners and entrepreneurs frequently use to gauge financial success in early years is through a break even analysis. It’s this definitive point to a company’s financial portfolio that helps to define whether or not a business venture was profitable, or costly. In other words, break even points help to express how much money a company needs in order to cover both variable and fixed expenses and a break even point calculator can help you determine these points. Determine a substantial break even point, based off of timely financial projections. 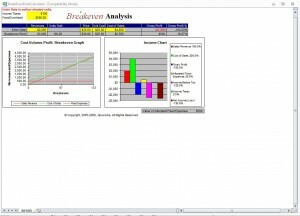 The Break Even Point Calculator contains movable, clear graphs that alternate per the data entries you insert. Organize financial projections based off of sales revenue, cost of sales, gross profit, allocated fixed expenses, income before tax, income taxes and net income. Identify a problem within your customer’s workflow, and navigate a solution to solve it. Honing in on what is relevant to your audience’s preferences and needs is crucial to organizing a profitable business. Recycle. As much as you’d like to devise a completely new, innovative product to throw onto a specific market, try not to bite off more than you can chew. Chances are, someone has already formed an outline or branch of the idea. As a start-up business owner, it’s your job to research the ways a specific product can be made better. Think in terms of longevity. Although you’re likely to encounter more than a few trendy, alluring niches in your search for the perfect market, try to form a more stable, long-term plan. Will your product be relevant two years from now? What might change market- or technology-wise during that time?